If you’re serious about helping the environment and reducing global warming, then don’t have children. That's the advice from the experts—population growth is one of the biggest contributors to global warming. For that reason, when I was truly fortunate enough to become pregnant, I didn't take lightly the responsibility to raise a child in a way that's friendly to the planet. The best way I know to lessen the impact of bringing a child into this world is to create the most sustainably designed surroundings for my baby’s future life in Singapore, where I live. You hear a lot about “sustainable design,” “non-toxic” merchandise, and “organic” products. Often these terms are used loosely and turn out to be inaccurate. My goal with this sustainably designed nursery was to leave a low impact on the environment, while creating a safe and low-toxic surrounding for the baby. This was inspired by using mostly regional, ethically-made or renewable resources, and using natural and organic materials, as well as up-cycled and vintage elements. While it is possible to find GOTS-certified organic and low-toxic materials, in reality, toxins are all around us. Toxins can be found occurring naturally, and also with man-made chemicals used to make the things we buy and encounter on a daily basis. But we can attenuate toxins by researching and asking more questions of suppliers we buy from about their materials and manufacturing methods. That helps us purchase locally and ethically made goods as much as possible to support the circular economy. One of my initial thoughts was that my child will wear cloth diapers and have little to no plastic in terms of toys etc. I was actually thinking about a "three toy policy" for any given time, but then I was convinced that might be a bit extreme for city living; I’m open to various methods of making and playing but not keen on any unnecessary plastic. For this bright and cozy nursery, I wanted to make the most of what I already had and honor local and regional resources and artists in the overall concept. I began my search for up-cycled and vintage furniture for the main pieces. After much trolling on Carousell, an app for buying and selling secondhand goods, I found a beautiful French baby cot and solidly made changing table. I also got the delightful chance to meet new people at the various pickup locations across the island of Singapore. For the changing table, I had laminated cotton, fern print inserts made. I took Ikea fabric storage boxes and had a Chinatown calligraphy artist, Jessie Ren, label them in Mandarin characters for “cloth diapers,” “tops” and “bottoms” to keep organized. The Singaporean locals who helped me with the translations made this a community effort. up-cycled changing table, Mandarin calligraphy-labeled boxes for cloth diapers and jasmine plant. 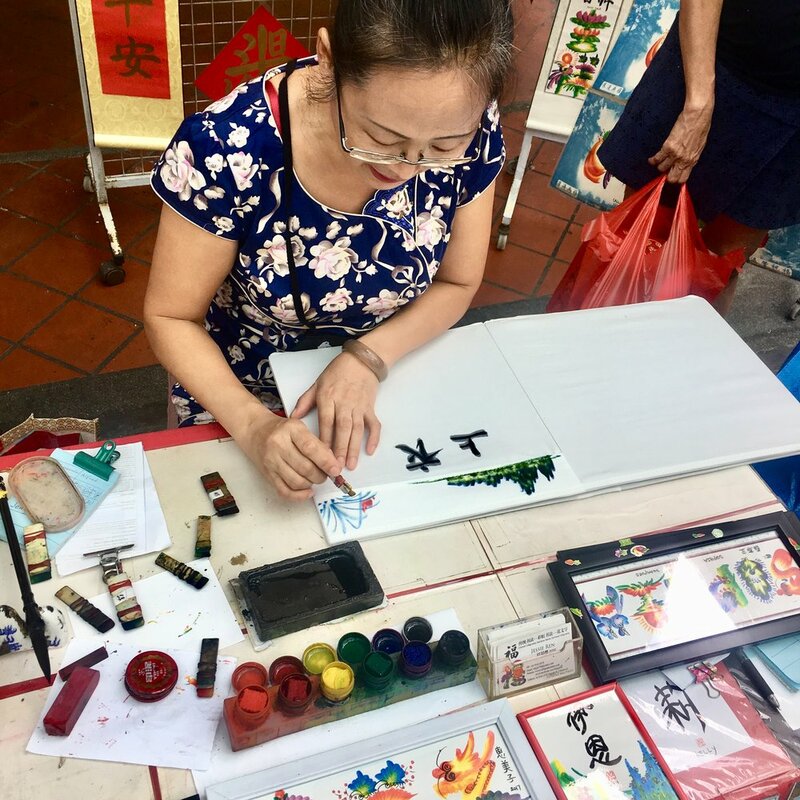 Chinatown calligraphy artist, Jessie Ren. She wasn’t pleased about the fabric bleeding the ink but I didn’t mind and we rolled with it. Friendly Singaporean folks who helped with the Mandarin character translations. The blue rocking dragon is designed by local designer Jarrod Lim. It's made of Sungkai wood from Indonesia, which is a plantation-grown, fast-growing resource. The design references old-school playground dragons, created in the early 70’s by Mr. Khor Ean Ghee, once found commonly in Singapore. Finding a suitable organic and low-toxic play mat—one that wasn’t made of synthetic foam but was still padded— was challenging. But the CorkiMat seemed like the best choice for my home: made of cork fill with a GOTS-certified organic cotton cover. Rocking Dragon by Jarrod Lim with CorkiMat play mat, made of cork fill with a removable GOTS-certified organic cotton cover. The blue paper collage and painting is by Burmese artist Min Zaw, depicting Inle Lake in Myanmar. The baby cot bedding and changing pad cover is GOTS-certified organic cotton printed with water-based dyes. The cot mattress itself is all-natural latex core from Bay Shop, which sources its eco-INSTITUT-certified latex from Thailand. It's covered in 95% organic cotton fabric. Latex, made through the Dunlop process, is a great choice for Southeast Asia, as it’s naturally breathable and cool to sleep on for the baby’s rest. Hanging above the crib is a makeshift mobile formation, made from traditional, Singaporean lion dance marionettes found in Chinatown souvenir shops. The yellow “dancing ladies” orchids are potted in a blue and white ceramic vase found at Thow Kwang Pottery Jungle in Singapore. The Pottery Jungle was established in 1965 and operates the oldest dragon kiln (wood-firing kiln) on the island. The lighting consists of a hanging bamboo pendant that was found in Hoi An, Vietnam. It was Scandinavian-designed and made by local Vietnamese women who taught me how it’s folded to create its arched shape. The globe floor lamp is a 90’s Art Deco reproduction made with inlay stone veneer, labeled in English and Mandarin, sourced at Tong Mern Sern Antiques, located in a pre-war shophouse in the nearby Tanjong Pagar neighborhood. Watch to see how this bamboo shade is folded. The simple wooden stool is made of local wood, and once sold by roadside merchants from the Singapore "kampongs," or villages, after WWII. Atop sits a Taoist joss paper radio from a shop on Mosque Street in Chinatown. Joss paper is traditionally burned to ensure that the spirits of the deceased have good things in the afterlife. In this nursery, the paper radio could symbolize the songs and stories taught by past loved ones and act as a portal to imagine new ideas and sounds that mama and baby can sing together. With the right combination of freedom and encouragement, I can envision the endless potential of this little one contributing to solving some of life’s many earthly challenges.